During Jiading years ruled by emperor of Ningzong of Song Dyasty, when assessing the zen-garden in Zhejiang province, Jingshan Temple came first, Lingyin was the second, followed by Jingci and Tiantong in Ningbo and Ayuwang was the fifth. 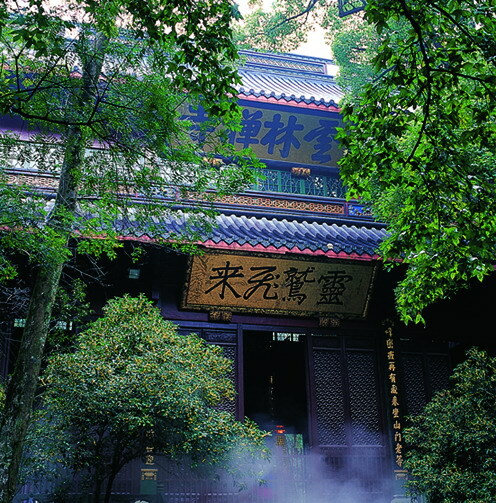 Emperor Lizong of Song Dynasty renamed Mahavira hall of Xianqin temple in “Juehuang hall” and gave it four words “miao zhuang yan yu” which meant that the temple was a wonderful manor and strict area. 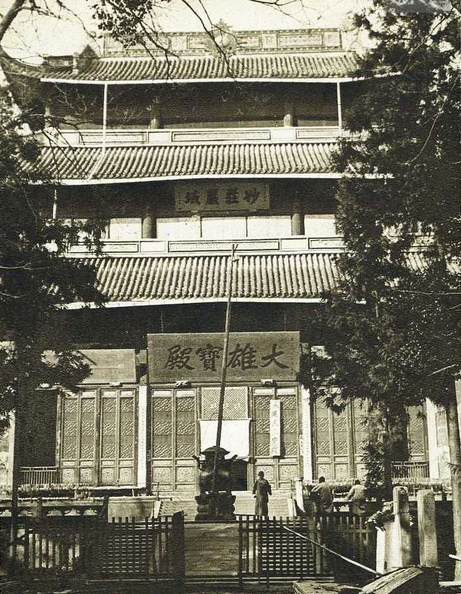 From the years of emperor Wuzong of Yuan Dynasty to the first year of his reign, the “Juehuang hall” renamed by Emperor Lizong of Song crashed down because of rot, but it was renovated by monk Cizhao, abbot Zhengchuang and 平章 Zhangdi. This renovation had lasted for four years and finished in the first reigning year of emperor Erzong of Yuan Dynasty. From emperor Shun of Yuan to the 4th year of his reign, chan master Zhuquanfalin relocated from Jinci to Lingyin which was once full of Buddhist atmosphere and even the government granted it a gold cassock. From emperor Shun of Yuan to the 19th year of his reign, the temple was destroyed by warfare. In the third year of Hongwu of Ming Dynasty, the first founder of Ming Dynasty Zhu Yuanzhang commanded the abbot Jianxin of Lingyin temple to discourse, which made a stir in the court and the commonalty and people all showed respect. Meanwhile, Zhu regarded him as one of the “ten great monks” with a gold cassock and asked him to write the four warnings “righteous heart”, “hardworking-oriented”, “thoughts-emphasized”, and “talent-respected”. After that, Jian was poisoned and killed as a result of the case of Hu Weiyong. The same year, Lingyin caught large-loss fire. 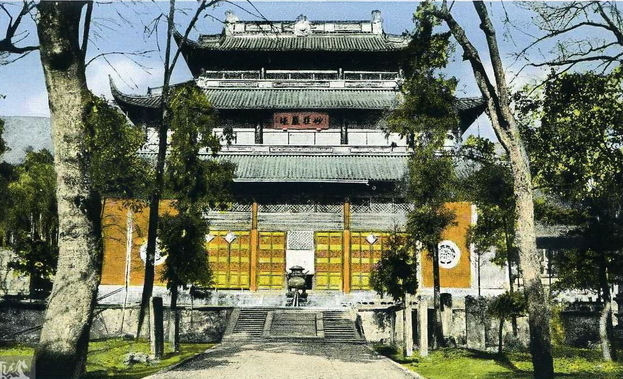 In the 17th year of Hongwu, abbot Huiming rebuilt the Jue　Huang Hall and named it “Ling Yin temple”. 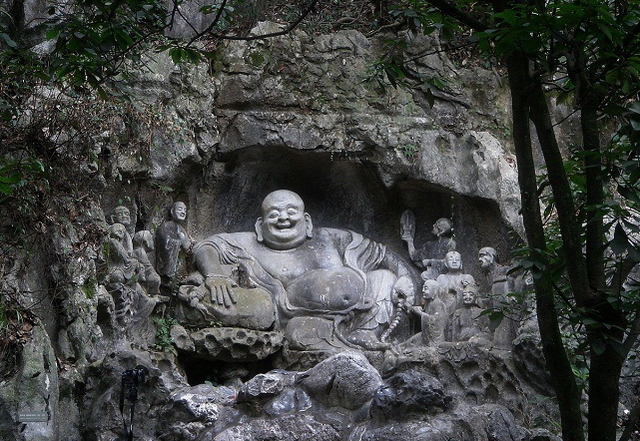 Owing to the shortage of fund, the Buddha in buddha- hall were finished to reshape till the first year of Yuanle. The fund was raised by the monk Shancai to renovate the great Buddhas and sacrificial vessels. In the 15th year of Xuande, Juehuang hall was destroyed again by fire. In the 17th year of Xuande, the abbot Tanzan built the left and right doors and contemplating room. Then the abbot Liangjie rebuilt Juehuang hall. In the 11th year of legitimism, the monk Xuanli established zhizhi hall and the amount of the hall was written by Zhang Jizhi. At this time, the temple was restored and many buildings had been rebuilt, such as Mile pavilion, Lianfeng pavilion, Qianfo hall, 延宾水 pavilion, wanghai pavilion, baiyun nunnery, and songyuan nunnery etc., thus, the temple was looked like before to an extent. In the third year of Longqian, the whole Lingyin temple was ruined by the thunder and fire, just remaining the zhizhi hall. In the 10th year of Wanli, ministry of personnel Zhanghan, and minister of crime Lu Guangzu etc., welcomed the master Rutong to take over Lingyin temple and preach, winning plenty of trust and prestige. In the 11th year of Wanli, Lingyin Temple started to renovate from this winter and it took five years to accomplish. The audience hall was built through imitating the Tang Dynasty style with 48 flat pillars and 16 peristeles. Moreover, Juehuag Hall was rename by “Mahavira Hall”. In the 18th year of Wanli, Rutong and the monk Fusui rebuilt Ligong Touwer with modeling 500 arhats in the main hall. 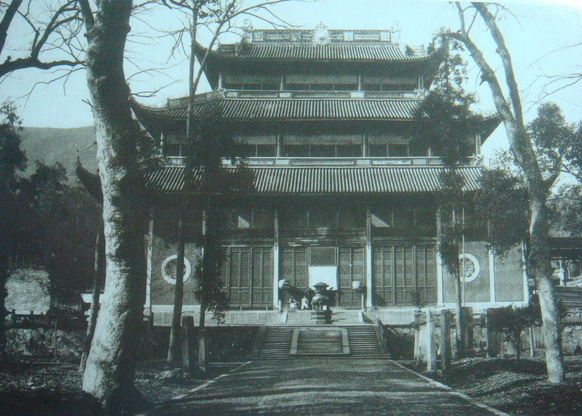 Sanzang hall was rebuilt on the site of Mile Pavilion, behind of which were Zhizhi Hall and the abbot quarters. The left of the abbot quarters was Miaoling Pavilion and the right was Xuanfo Hall. Meanwhile, Zhanghan wrote down and record them. In the 28th year of Wanli, 司礼监Sun Long repaired the temple and placed 轮藏 to carry the collection of classics, 638 pieces in total. At the left of轮藏 was the collection of lamps, 49 lamps in total and right was the collection of paintings of water and land, 25 pieces in total. In the 13th year of Chongzhen, Lingyin Temple suffered the disaster again that the whole temple was destructed by fire, except that the main hall, Zhizhi Hall etc. survived and the rest were all swallowed by fire. 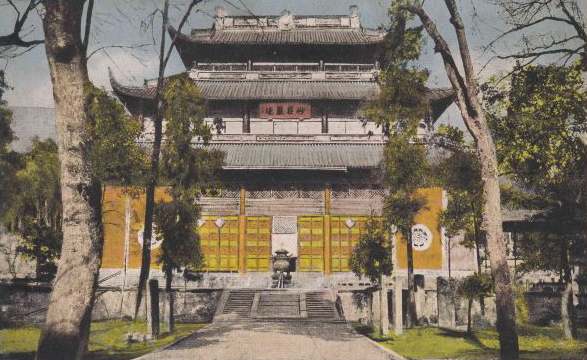 In the 6th year of Shunzhi of Qing Dynasty, the monk Jvde carefully examined Lingyin Temple built by the monk Rutong at the end of Ming Dynasty which cost 80,000 silver dollars. However, the labor and material were increase so high and the renovation needed at least 1 million silver dollars that lots of monks opposed strongly. Regardless of the controversy, the monk Jvde went through innumerable trials and hardships and spent 18 years in making Lingyin Temple have a new look. Lingyin Temple repaired by the monk Jvde had a very large scale. There were 7 palaces, 12 halls, 4 pavilions, 3 buildings, and 3 lofts. In addition, Five Hundred Arhats Palace, also called Tianzi Palace was built below the west meditation room and had 54 rooms in total. At that time, people all called Lingyin Temple “the first mountain in southeast”. In the 28th year of Kangxi Dynasty, when Emperor Kangxi made an inspection tour in Hangzhou and paid a famous visit to Ling Yin Temple. The abbot Di Hui asked the emperor to inscribe words on a plaque, a customary honor. 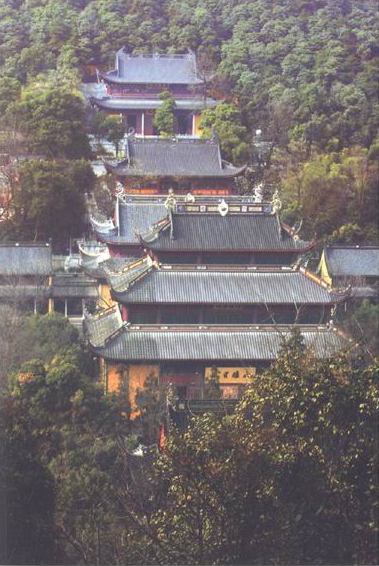 The emperor wrote two words “Yun Lin” (forest of clouds) as Lingyin Temple was then renamed, “the Yunlin Temple”. Emperor Kangxi returned to the Lingyin Temple three times respectively in 1699, 1703 and 1705, and documented his travels in text and poetry that have been cherished since. In the 6th year of Yong Zheng Dynasty, Li Wei, the governor-general, was appointed to rebuild the Mahavira Hall, Heavenly Kings Hall and several attics of halls and so on. On the second day of June of 1733 (Chinese lunar calendar), two thousand Buddhists were awarded five-hundred-tael gold from treasury (one tael of that era is approximately 35-40grams). At the early days of Qianlong, Ju Tao, the abbot who was the successor of Di Hui, was put in an important position by the governing for his being well-read and excellent attainments in Buddhism. When traveling to the Lingyin Temple, a strong bond was formed between the pantler Wang Yinggeng of Yangzhou Ju Tao upon first meeting. So he endowed money to rebuilt the Mahavira Hall and other ten places such as halls, pavilions, buildings, attics and so on. Repainting five hundred arhats and repairing Hejian Bridge, Longhong Cave, Jiufeng Path and so on cost twenty-thousand-tael silver in all. The construction took three years from October in 1741 to October in 1744. Emperor Qianlong visited Ling Yin Temple for six times (1751, 1755, 1762, 1765, 1780 and 1784) the trips were recorded in the travels—some records were inscribed on stone monuments and still stand before the temple. At the 41st year of Qianlong Dynasty, procurator Xu Shu and all departments of Sidao donated to renovate the Lingyin Temple because of its disrepair of many years. At the 44th year of Qianlong Dynasty, a period which Lingyin Temple and Tianzhu Temple was under the same abbot, a special arrangement was made to balance the resources and attention to both temples. The old system of managing according to the division of labor resulted that Tianzhu Temple subsidized grain which costed two-thousand-tael silver to the Lingyin Temple every year. This method hadn’t been canceled until the Republic of China. In autumn of the 21st year of Emperor Jiaqing, the Lingyin Temple was destroyed by fire. The Lingyin Temple requested royal for ten-thousand-tael gold from treasury for finding it difficult to reconstruct such huge works. Officials donated eleven thousand tael silver and the rich such as Wang Dalin, Jin Zhaoxin donated, too. It gained one hundred and seven thousand tael silver in all. The temporal abbot Yi Qian raised about twenty-thousand-tael money from gentlemen of West Zhejiang. The work started from July 7, 1823 to April 16, 1828 which costed one hundred and thirty seven thousand tael silver. It restored the magnificence of the temple and the beauty of the mountain. At the 14th year of Daoguang Dynasty, Ruan Yuan was the procurator of Zhejiang who care for the Lingyin Temple. He suggested to integrate the articles of Zhuxi, Wen Fanggang and so on, and collected them in the Lingyin Temple. So “The Lingyin Library” was built. Ruan Yuan collected a lot of classics. He not only numbered the books, made rules and choose Yufeng, Ouran two monks to regulate works, but also wrote the biography of the Lingyin Library by himself. At the 10th year of Xianfeng Dynasty, the Taiping Army invaded into Hangzhou. Most temples were destroyed, and just Heavenly Kings Hall and Arhat Hall of the Lingyin Temple survived. A large amount of valuable objects from the Lingyin Library were raided and made their way to private collections or lost completely. At the 2nd year of Xuantong Dynasty, the Mahavira Hall was rebuilt, 45 meters high. At the 6th year of the Republic of China, the Da Bei Pavilion (Great Mercy) was built. At the 19th year of the Republic of China, Que Fei became the abbot. He rectified the temple and give it a new appearence by rebuilding the Cuiwei pavilion, Chunzong pavillion and Heavenly Kings Hall. Reconstruction work on the statues of the Heavenly Kings of Heavenly Kings Hall. In winter of the 25th year of the ROC, Arhat Hall was burned down. The xylographic statue of Bodhisattva Wei Tuo in Heavenly Kings Hall was the only treasure of previous generation surviving in the fire. Its body was made of camphorwood which could be dismantled piece by piece. The whole statue is a valuable among xylographic figures of the South Song Dynasty for it has not one nail—the complex pieces are finely crafted to be wedged in place. 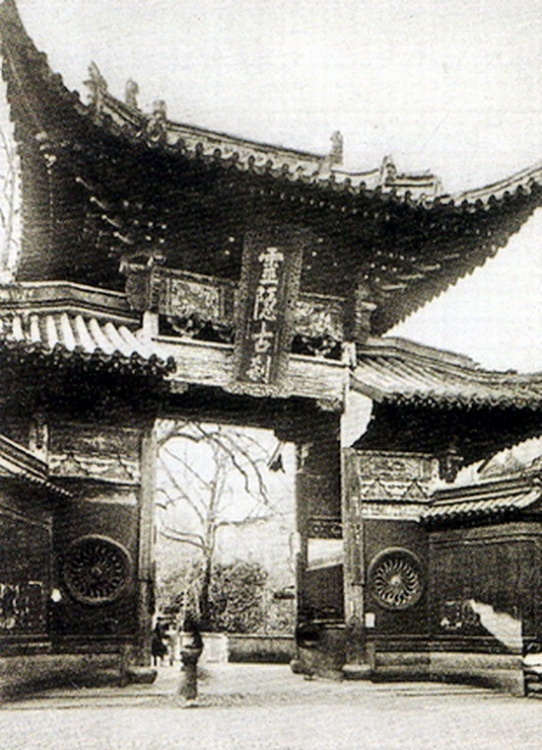 In November of the 26th year of the Republic of China, the Japanese aggressors invaded into Hangzhou, and citizens fled to Lingyin Temple and Tianzhu Temple. The Red Cross set up a refugee camp at Lingyin Temple which contained five hundred or six hundred people. The situation was full of noisy, disorder and too ghastly to be looked at. At that time, the Monastic Reception, the Jialan Palace, the Incense Pavilion and the east gate of Lingyin Temple were ruined by the conflagration because of the refugees losing their guard in the midnight. In summer, “the Reparative Board of the Mahavira Hall of Lingyin Temple of Hangzhou City” composed by the Department of Civil Affairs managed the repair work. It took more than two years to complete the Mahavira Hall with the financial grant from the government. The humidity of environment around the Lingyin Temple was so high that the original brick and timberwork was transformed to armored concrete construction. The Mahavira Hall, a double-eaved roof, 33.6m high, covering an area of 1200 square meters, is the main shrine of the entire temple with a magnificent facade. Sakyamuni Buddha as the main statue is 19.6m high, and 24.8m high with the Lotus Agora. It was made according to the blueprint of the famous statue of Tang Dynasty by the experts of CAFA and folk artisans. It was engraved from 24 huge camphorwoods, which looks dignified and majestic. All the bun, folds and posture were characterized by Buddha’s carving of Tang Dynasty. The Buddha sits cross-leggedly, raising right hand and putting left hand on his knee with slightly open eyes, plump cheeks and mild smile. It was all wrapped in gold foil which looked radiating brilliant light, powerful and dignified. This statue is recognized as the official Sakyamuni Buddha by international Buddhists and scholars. The statues of twenty kings lie in both sides of the Mahavira Hall. At the end of that is the twelve pratyeka-buddha figures. It was said that the layout of the pratyeka-buddha were rarely seen in countryside temples. Behind the Buddha were a group of Avalokitesvara-Buddha of Island——”Sudhana learning from 53 good knowing advisors”. There were 156 clay-sculptured Buddha statues above it, parts of which are wrapped with gold folds. They looked so vivid and full of third dimension with all sorts of attitude. The whole repair starting from November of that year was authorized by the State Council for the need of receiving state guests. It costs more than 1,300,000 yuan. All the Buddha statues in the temple were covered with gold leaf. The stone pagodas, Jing Zhuang and others such as SCULPTURES OF FEIL AIFENG PEAK were rebuilt for protection. It was ended in 1980. The Lingyin Temple carried out double-track system with 十方丛林制 to the outside and implementing democratic management inside. It also established the management committee of temple. In the resource of outlay, it can be self-sufficient through putting ticket system(fragrant flower coupon ticket) into pratice, and take part in the social and charitable causes actively. The Lingyin Temple was confirmed as the national key Buddhist temple in the area of Han by the State Council. <The Overall Plan of the Lingyin Temple> began to be operated. With the support of the Buddhist Association as well as the protection and concern of the Buddhists from home and abroad, the regulators Genyuan, Jiyun and Tiyan led two groups of disciples to renovate the Mahavira Hall thoroughly and regilded the Buddha. Monk Muyu took the post of the abbot of the Lingyin Temple. He led some capable mainstays, and gave full play to the fine tradition of Buddhism. According to the 伽蓝规制, he distributed in depth, improved the ancient temple's solemn atmosphere, and rebuilt the Sutra Library as well as the Hall of Five Hundred Arhats. 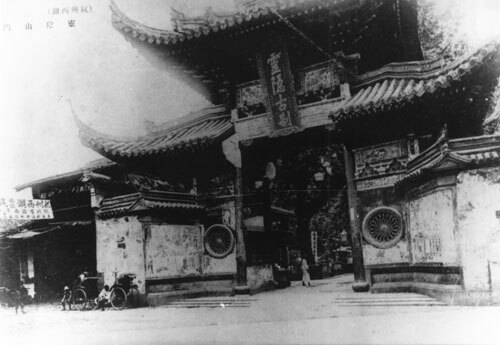 During the Northern Expedition, Xu Tujin, the head of the 31th regiment within the jurisdiction of the warlord Wu Peifu, burned down the Lingyin Temple in order to steal the millennium ancient Buddhist treasure--Born Heavenan--an ancient cylinder 座化by the first abbot of the Lingyin Temple. On March 3, 2004, the reasure of the Lingyin Temple--Born Heaven came back to the temple after a 77-year separation. On October 8, Venerable Guang Quan was enthroned to the abbot by elder Chuan Yin——the president of the Buddhist association in China.